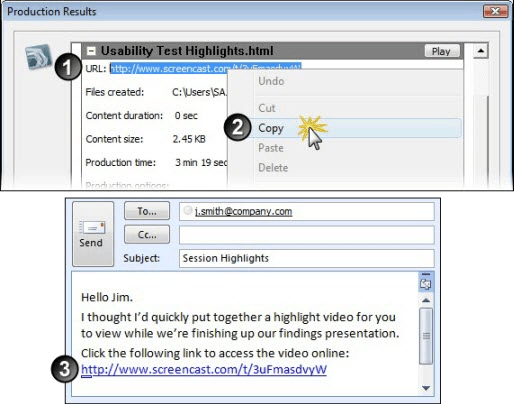 Learn how to put your videos on Screencast.com for an easy way to share highlights with stakeholders. From the Present tab, go to File > Produce and Share > Highlight Video. The Production Wizard appears and leads you through the production process. Click Sign In to sign in to or create a Screencast.com account and access Upload Options. Click Upload Options to access options for uploading to Screencast.com. Click Next. Select the storyboards you want to produce. Click OK to close the Screencast.com options dialog box. Click Next. Select one or more Storyboards to produce. Set the size of the produced highlight video. For screen video, we recommend using the default setting, which is Largest video size. For more information about the options in this dialog box, see Video Size Options. Click Next to continue. The Produce Video dialog box appears. Set the destination folder for a local copy, file name options, and file size options. For more information, see Produce Video Options. Click Finish. The rendering begins immediately. When rendered, videos are uploaded to your Screencast.com library. With the cursor, highlight the URL. In an email, document, web browser, etc, right-click and select Paste.